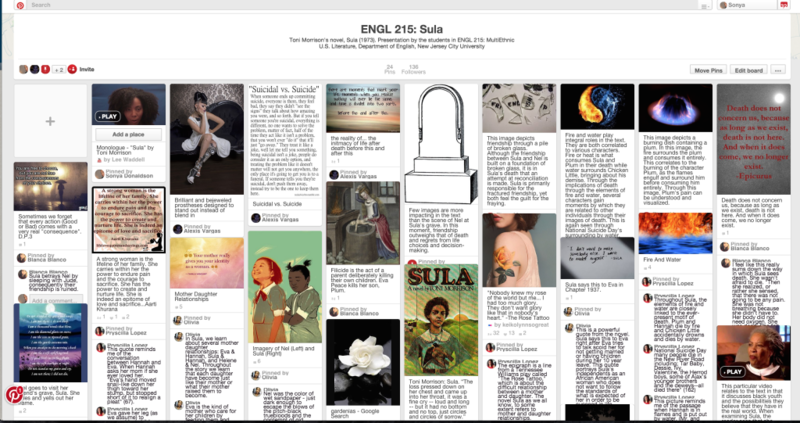 ENGL 215 Final Exam, Sula Pinterest Board (Annotated). Spring 2015, New Jersey City University. This past Spring, I presented my students with a new option: they would design and conduct a collaborative final exam. Not surprisingly, they were freaked out. How would it work? What did they have to do? How would it affect their grades? 2. Develop three conceptually rich questions for discussion. By “conceptually rich,” I mean questions that engage us to think deeper about the text. You must provide specific passage references and demonstrate that you have developed a nuanced perspective on the questions at hand. 3. Create three visual pins for the course’s final Pinterest board; each pin must be a representation of some aspect of the text. In addition to the visual, you must also provide annotations that explain why you chose the image, what it represents from your perspective, and how it relates to the text. I provided them with a sample set of questions I had developed in a course I took as a graduate student, when I worked on Claude McKay’s Home to Harlem. At this point, it dawned on them that what had seemed to be a simple “test” was in fact, quite complex because a great deal of it hinged on the “conceptually rich” and “relevance” components. “Professor, you’re tricky,” one student remarked. Yes, I am. And they went to work. This is the Pinterest board they created. On the day of the final, I welcomed them to their extended conversation, explained that the classroom was theirs to do as they wished. They could sit in a semi-circle, use the computer and projector, walk around–whatever they needed to facilitate a rich, two-hour conversation. One student began with a brief explanation of her Pinterest submissions. Another followed. Before long, we had a dynamic final exam; students took turns presenting a question, they asked each other questions, they jumped in when wanted to add to someone’s question or comment, they moved from seat to the board and back again. They commented on the connections between the Pinterest board and the text; they discussed their strategies for locating images, videos, and sound. For example, one student discussed the challenges they faced in finding an image of a burning plum that perfectly encapsulated that moment in Morrison’s text, when Eva sets Plum on fire. My favorite pin was the one on filicide, as it opened up a deep conversation about Eva’s relationship to her children, maternal love, and murder. The image, “Nature Forging a Baby” from the Roman de la Rose (1490-1500, artist unknown) was refashioned by the student into filicide, as a way to engage with Eva’s actions of both killing Plum and attempting to save Hannah. During the process, I took copious notes. I briefly interjected when the conversation stalled, offered a question to refocus, and offered encouragement to a nervous student who asked a series of brilliant questions that were met with silence. My advice in this moment: I asked the student to repeat her question; then asked the class to take a minute or so to reflect on these questions. I explained to them that silence was not always a bad thing in the classroom, that it can also be productive. I followed up the final exam with a note to them thanking them for their engagement. I hope to have more of these collaborative final exams. It was clear to me that the students took the assignment seriously: they brought their well-thought-out questions to class (they were required to submit them before leaving the room) and engaged with each other in a considerate, respectful, and intellectually challenging ways. I plan to do more of this work. Look for my next post on how my students developed another brilliant final exam on Suzan-Lori Parks’s In the Blood.